News | Greenhouse Lighting and Systems Engineering | Working for more efficient and sustainable greenhouse production. View March 2018 GLASE newsletter. 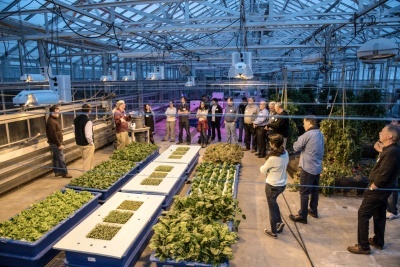 Greenhouse Lighting and Systems Engineering (GLASE) consortium brought together many of the major horticultural lighting companies in the United States on March 20, 2018. The purpose of the web meeting was to discuss how GLASE can accelerate the adoption of energy-efficient lighting technologies to expand the marketplace and to increase the profitability of controlled environment agriculture (CEA) facilities. The GLASE consortium is developing a framework to support collaboration with lighting companies aimed to promote technology development and increase the adoption of horticultural lighting and control systems by CEA producers. Having identified lighting companies as the consortium’s primary beneficiaries and CEA producers as target customers, GLASE will work with its industry members to demonstrate the benefits of energy-efficient technologies and expand the market for all segments of the CEA supply chain. This includes LED manufacturers, lighting, sensing and control companies, and CEA producers and service providers. Meister Media Worldwide (Greenhouse Grower). As a non-commercial organization, GLASE provides scientific-based data to demonstrate the applications and benefits of advanced greenhouse control systems and how it can increase CEA profitability margins. Morgan Pattison, founder and president of Solid State Lighting Services Inc., says advancements in LED technology will have a major impact on the production of horticulture crops. With a PhD in materials science from the University of California-Santa Barbara, Morgan Pattison has long believed that light emitting diodes (LEDs) were going to eventually dominate the illumination market. His thesis research advisor was Dr. Shuji Nakamura who invented the blue LED. Nakamura received the Nobel Prize in Physics in 2014 for his invention. “Professor Nakamura was instrumental in showing me the importance of this technology and this put me in a good position to be involved with LED research,” said Pattison. Pattison started Solid State Lighting Services Inc. in 2008. The company, which focuses on LED lighting, provides technical consulting to other companies and organizations assisting in understanding how the technology of LEDs fits together. “Our biggest and longest running client is the Department of Energy,” Pattison said. “I operate as a contracted senior technical advisor to the DOE SSL Program. In that capacity, I do a lot of technology and scouting and looking for what is coming down the road in terms of applications for lighting. The LED technology platform continues to change what’s possible with lighting and this opens up new applications for lighting. Pattison works with the DOE to understand new components and materials that will advance the status of the technology and to determine promising R&D investment. In January 2018, DOE released a horticultural lighting energy report, Energy Savings Potential of SSL in Horticultural Applications. Pattison, who was one of the coauthors of the report, said the publication addresses the energy implications for horticultural lighting and transitioning it from conventional sources to LEDs. 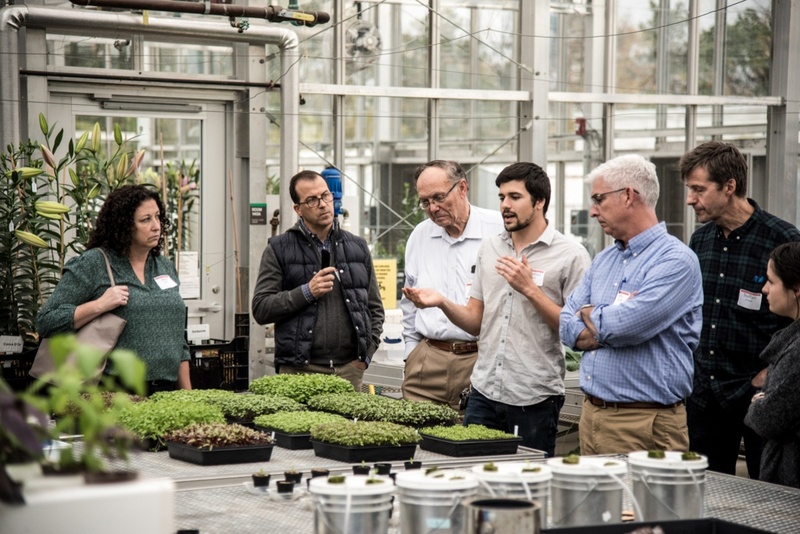 “I engage with horticultural experts in talks and meetings to try to connect them with my understanding of LED technologies so that they can make informed research decisions,” he said. “There is a lot of information floating around about horticultural lighting. Because there are not a lot of defined characterization standards, it is more difficult to debunk some of the claims being made. Pattison said as advancements are made in LED technology there could be an individualized LED light for each type of application. “In the past there were only a handful of different bulbs,” he said. “There weren’t a lot of lighting technologies or options to choose from. In horticulture, generally speaking, growers are using high intensity discharge street lights to illuminate their crops. Most growers are still using street lights because right now that’s what works best for them. Pattison said improvements can also be made with the lighting fixtures and light distribution systems. Pattison said another impact LED technology could have on horticulture is how greenhouses or any other growth environment are designed. Pattison said LEDs could also revolutionize how plants are bred and grown. Pattison said the transition to LED lighting has also forced everyone to rethink the change-out cycle for lighting products. “We’re moving away from having light bulbs at all because LEDs can last so long,” he said. “The lifetime of lighting products, including horticultural products, is characterized based on how long it takes the output to depreciate by a certain amount. There are other reliability considerations. With general illumination, a light bulb may be good until it reaches 70 percent of its initial output because humans are very forgiving with light levels. But in horticulture if the light drops 70 percent, then plant growth drops 70 percent. “There are different LEDs for horticulture. Red LEDs have different lifetime constraints than blue or white LEDs. Horticulture applications use more red LEDs and the LEDs can depreciate at different rates. The color could change to a less optimum level. Solid State Lighting Services Inc., (805) 217-3878; info@sslsinc.com; sslsinc.com. David Kuack is a freelance technical writer in Fort Worth, Texas; dkuack@gmail,com. As a member of GLASE, EnSave Inc. will provide technical services and use its extensive data base of agriculture energy metrics to help growers improve their energy efficiency. EnSave Inc. is an engineering and consulting firm focused primarily on energy efficiency and renewable energy for the agricultural sector. In operation since 1991, the company, which is headquartered in Richmond, Vt., works with agricultural producers nationwide, including greenhouse growers. “We have about 300 data collectors who we use throughout the country to facilitate the programs and services that we offer,” said Kyle Clark, vice president-business development at EnSave. One of EnSave’s core services is conducting energy audits, which are typically done through USDA-sponsored programs. One of the programs called the Environmental Quality Incentives Program (EQIP) is administered through USDA’s Natural Resources Conservation Service (NRCS). The company also does energy audits and grant writing for USDA’s Rural Energy for America Program. Clark said greenhouse growers and farmers approach EnSave wanting to reduce their energy costs and looking for funding to conduct energy projects. “The first step for most farms is having an energy audit done through the EQIP program,” he said. “They can receive funding from USDA to do the audit. Conducting these audits, EnSave has to follow industry criteria established by the American Society of Agricultural and Biological Engineers. Clark said that greenhouse growers are eligible to participate in all of the same programs as farmers. Clark said one of the primary reasons that greenhouse growers and farmers conduct energy audits is to try to reduce overhead costs. “In some ag industries, like the greenhouse and poultry sectors, the margins are very tight, so anything that they can do to reduce operating expenses is going to be a big help,” he said. “An even bigger motivator is the fact that an energy audit is required to access most federal financial assistance or incentive programs. For EQIP and REAP, both federal programs, a grower needs to have an energy audit conducted by a qualified third party in order to apply for that funding. EnSave’s membership in the Greenhouse Lighting and Systems Engineering (GLASE) consortium developed out of its relationship with NYSERDA. NYSERDA is providing $5 million to fund GLASE for seven years. All of the audits that EnSave conducts track energy metrics associated with each farm and greenhouse. Data collected includes base-line energy usage information for heating, fuel usage, electricity usage and costs, number of lighting fixtures, type of fixtures, type of heaters, building construction, building size and building age. Clark said using EnSave’s data mining capabilities will enable the company to develop energy performance benchmarks that could be normalized on a per unit of production basis. Clark said the work EnSave is doing with GLASE and CEE could lead to combining and disseminating information from these two organizations that are working toward similar goals. “We also hope to provide services in terms of measurement and verification of new technologies as they are developed by the GLASE team. We do energy logging, which entails going out to a greenhouse or farm and measuring the electricity use in real time and analyzing the data. We would be a third-party tester or verifier of the performance of some of these new technologies. View January 2018 GLASE newsletter. How can you grow healthier crops with affordable lighting systems? Horticulture doctoral student Jonathan Allred, center, leads a tour of Cornell greenhouses in November. Photo by R.J. Anderson / Cornell Cooperative Extension. Indoor farming entrepreneurs and experts came to Cornell in early November with a goal: leverage the innovation at the College of Agriculture and Life Sciences to create viable businesses for local vegetables and produce grown indoors. Known as controlled environment agriculture (CEA), the systems combine greenhouse environmental controls such as heating and lighting with hydroponic and soilless production, enabling year-round production of fresh vegetables. The process extends the growing season through a range of low-tech solutions – such as row covers and plastic-covered tunnels – to such high-tech solutions as fully automated glass greenhouses with computer controls and LED lights. Led by Neil Mattson, director of Cornell CEA and associate professor in the School of Integrative Plant Science, Cornell has become a world leader in CEA research. In early November, the Cornell CEA Advisory Council, which was formed in 2015 to expand the retail and food service markets for products grown using CEA, hosted on campus more than 80 entrepreneurs and stakeholders from across the Northeast to discuss the state of the indoor farming industry, urban agriculture, supermarket trends and new technology. At the conference the group announced the formation of the Controlled Environment Agriculture Global Association, an organization to foster growth, understanding and sharing ideas related to controlled environment agriculture and associated industries. Erico Mattos, executive director of the newly formed Greenhouse Lighting and Systems Engineering (GLASE) consortium, presented his vision to advance CEA by bringing together expertise from industry and academia to create solutions. “The CEA Advisory Council meeting provided a great opportunity to connect with key players from the different segments of the CEA supply chain in New York. I was impressed with the quality and quantity of the ongoing initiatives in this area supported by Cornell University professors and staff members and the level of engagement from the industry members,” Mattos said. Mattos said private companies and public research from Cornell offer collaborative opportunities that can advance the CEA industry. GLASE Executive Director Erico Mattos was one of the co-authors who received the American Society for Horticultural Sciences Outstanding Cross-Commodity Publication for papers published in 2016. The award was given to the paper A Chlorophyll Fluorescence-based Biofeedback System to Control Photosynthetic Lighting in Controlled Environment Agriculture [J. Amer. Soc. Hort. Sci. 141(2):169–176] published in partnership with a team from the University of Georgia. The announcement was made at the Award Ceremony during the Plenary Session at the 114th ASHS Annual Conference at the Hilton Waikoloa, Waikoloa, Hawaii on September 19th.